Silver and Turquoise is used together to make Turquoise Jewelry in many parts of the world, however, nowhere else in the world has Silver and Turquoise made such a statement in culture and art form than in the Southwest Regions of America. Southwest Native American Indians of the past used Silver and Turquoise to create beautiful Jewelry and today the Turquoise Jewelry is stronger than ever. 1) Silver and Turquoise Multi-Stone Ring by John Hartman 2) Navajo hand crafted Silver and Turquoise Cluster Earrings 3) Lost Wax designed Silver and Turquoise Pendant with Royston Turquoise by Crystal Hartman. The Hartman family, owners of Durango Silver Co, are all Jewelers that use Silver and Turquoise as their materials of choice. We also make Gold Jewelry and have a good supply on hand at all times. Some of the most unique Jewelry designs being made in the world today are coming out of the homes and Jewelry manufacturers in the Southwestern United States and many are being made with Silver and Turquoise. 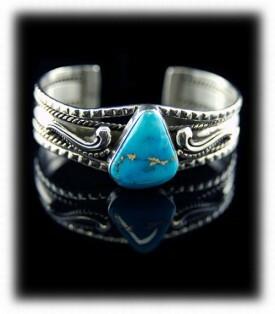 Demand is up, Turquoise is in fashion and Silver is now in vogue and Silver and Turquoise Jewelry is Hot! It's in the magazines, in the news, at the movies and superstars of all walks of life are wearing Silver and Turquoise Jewelry. Above are examples of Jewelry produced by Durango Silver Co; 1. 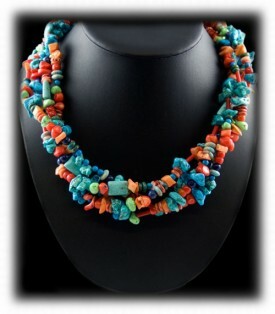 A multi-colored Gemstone, Silver and Turquoise Necklace made by Nattarika Hartman 2. 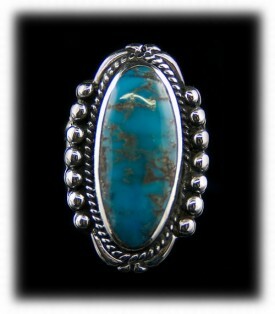 A Silver and Turquoise Ring made by Dillon Hartman 3. A Silver and Turquoise Bracelet made by John Hartman 4. 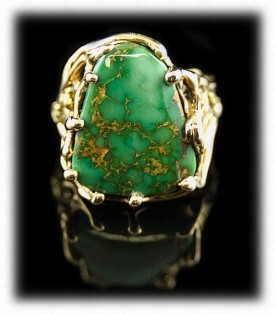 A Mens Turquoise Ring in Gold made by Nattarika Hartman and set with gold nuggets by John Hartman. 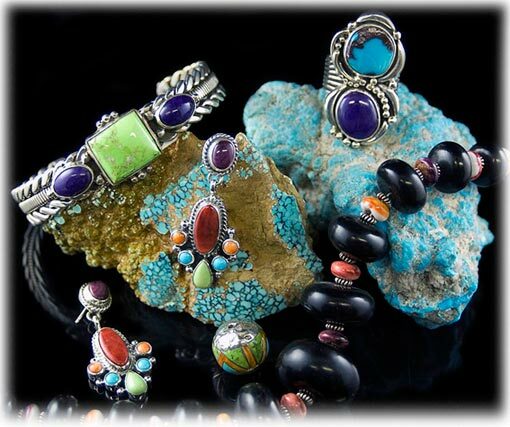 Durango Silver Company of Durango, Colorado USA is in the heart of the Southwest Silver and Turquoise capitol of the world. We make and deal in high quality Authentic Native American Turquoise Jewelry that is handcrafted right here in the Southwest. 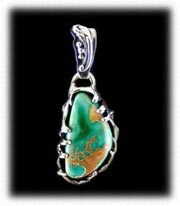 We use high quality Turquoise in every piece of Jewelry that we make or have made for us by Native American Indians from this area. 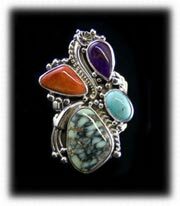 We specialize in Turquoise Rings, Bracelets, Pendants, Necklaces, Earrings and other Southwestern Styled Jewelry made from Silver and Turquoise. We make some of the best Mens Turquoise Rings in the world with exceptional Turquoise Gemstones and our Turquoise Bracelets cannot be found anywhere other than from us. We use fabulous Turquoise Gemstones, of unquestionable quality, in our Silver and Turquoise Pendants, Necklaces and Earrings which you will definitely appreciate. "The bitterness of poor quality remains long after the sweetness of low cost is forgotten"
We have lived by this rule for our entire life in business and we will continue till the end! It is our pride that each and every person that we deal with is satisfied beyond a shadow of a doubt. If you are interested in Silver and Turquoise Jewelry, think of Durango Silver Company for the very best and we will make you happy with the real thing! We have also created a fortress of great Informational Pages with photos and text for you to learn more about Silver and Turquoise as well as Turquoise Jewelry. We hope you enjoy our website and we look forward to adding you to our family of friends. Make sure you Join our Newsletter as we put our an occasional letter about what's going on in Durango, Durango Silver Company and Special items we have added to our site. We also have a monthly drawing for free Durango Silver Jewelry that we give away to our members. Thank you for reading about Silver and Turquoise.